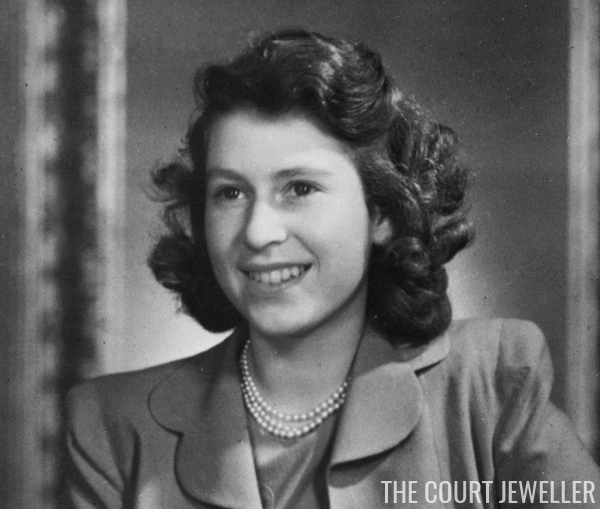 There are lots of 90th birthday tributes getting underway in honor of Queen Elizabeth II, and I thought there was no better way to celebrate her milestone here at The Court Jeweller than a look at 90 pieces of her amazing jewelry. This list isn't exhaustive, but it does showcase pieces in the order that they arrived in her collection, giving an interesting little look at the way the collection has been built over nine decades. Today: a look at ten pieces of jewelry she acquired between 1941 and July 1947. 1. The Jardinère Brooch: One of the very first pieces of important jewelry in the Queen's jewelry box was this little art deco brooch from Cartier, which was likely made in the 1930s. It's made of platinum and diamonds and shaped as a basket overflowing with flowers. The contents of the basket include cabochon ruby berries, bright blue sapphire flowers, and intricately carved emerald leaves. Leslie Field, who features a large color photograph of the brooch in The Queen's Jewels, notes that the piece was a gift to Princess Elizabeth from her parents in 1941. Above, she wears it while bicycling in Windsor the following year. 2. The Diamond and Aquamarine Clips: Princess Elizabeth received this classic pair of diamond and aquamarine clips from her parents as an 18th birthday gift in 1944, and she still wears them consistently today. Although Leslie Field identified their maker as Cartier, the Royal Collection's website explains that Boucheron is actually responsible for this lovely pair; in his Boucheron book, jewel historian Vincent Meylan suggests that the Queen's uncle, the Duke of Kent, had a part in their commission. 3. 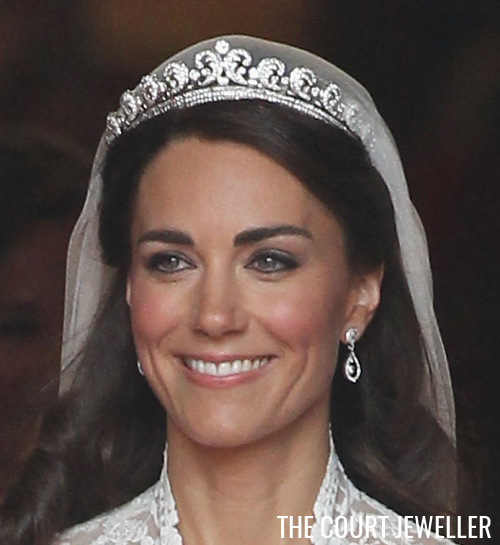 The Cartier Halo Tiara: Now iconic as the Duchess of Cambridge's wedding tiara, the Cartier Halo Tiara was actually the very first tiara that the Queen owned. King George VI, then still the Duke of York, bought the diamond and platinum tiara from Cartier in November of 1936 and presented it to his wife. In April 1944, the tiara was given to Princess Elizabeth as one of her 18th birthday presents. There are no photographs of the Queen wearing the tiara -- although given the number of private tiara occasions in the family, I've no doubt that she has worn it -- and she has frequently loaned it to other family members, including Princess Margaret, Princess Anne, and, of course, Kate. Hugh Roberts's The Queen's Diamonds features a large, detailed photograph of the tiara. 4. The Cartier Floral Spray Brooch: Another early floral addition to the Queen's brooch collection, this piece is described by Leslie Field as: "A Cartier gold spray brooch with one flower of all blue sapphires and another of pink sapphires and cushion-cut rubies. Both have square-cut diamond centres and one of the three leaves is set with pavé-set diamonds." Along with a matching set of earrings, Elizabeth received the brooch from her parents as a birthday gift in April 1945, and she wears it above a month later, just after the exuberant V-E Day celebrations. The Queen's Jewels has a large color photograph of the brooch. 5. The Sapphire Chrysanthemum Brooch: Although the most famous photograph of Princess Elizabeth wearing the brooch -- the honeymoon snap of her with her new husband, the Duke of Edinburgh -- dates to 1947, she actually received the brooch a year earlier. It was given to her to commemorate her launching of the British Princess, an oil tanker. The piece is made of platinum and set with diamonds and sapphires to form a chrysanthemum flower with a small stem. 6. The South African Diamonds: Princess Elizabeth was in the middle of a tour of South Africa with her parents and sister when she turned 21. During a ball celebrating her birthday in Cape Town, Field Marshal Jan Smuts (representing the government) presented her with a necklace of 21 brilliants separated with small baguette and round brilliant spacers. The Times reported that the princess reacted with "unaffected exclamations of delight" at the Garrard-made gift, which was set in platinum. She declared them to be her "best diamonds." She wore the necklace for the first time in Paris a year later, and in 1952, she had the necklace shortened (as you can see in the photo above). The leftover diamonds were used to make a coordinating bracelet. 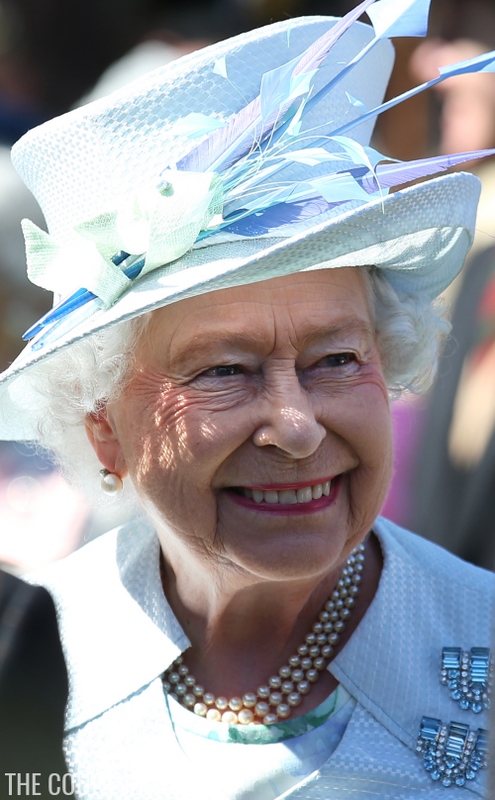 The Queen often wears her South African diamonds when attending events related to that country today. 7. The Greville Ivy Leaf Clips: These delicate diamond clips, made by Cartier, were a part of the large jewel bequest from Mrs. Greville to the Queen Mother in 1942. Two years later, the clips were given to Princess Elizabeth as a 21st birthday present during the South African tour. Made of diamonds set in platinum, the clips were commissioned by Mrs. Greville. Their natural ivy leaf motif makes them particularly classic and timeless, and the Queen still wears them today. You can see large, detailed photographs of the set in The Queen's Diamonds. 8. The Flame Lily Brooch: On the same 1947 tour, Elizabeth was given a delicate diamond, platinum, and white gold brooch in the shape of a flame lily. It was a 21st birthday present from the children of Southern Rhodesia (which today is Zimbabwe), who had collected small sums of money toward the gift. The Queen still wears the brooch today, but her most memorable appearance in the piece happened in 1952 when she stepped off an airplane in London after her sudden accession to the throne in Kenya. The Queen Mother and Princess Margaret later both received brooches of the same design, and the Queen now also owns her mother's flame lily brooch. 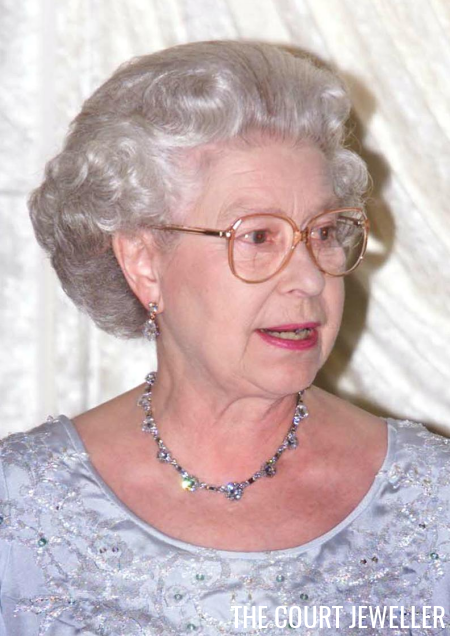 A large photo of Queen Elizabeth II's brooch is featured in The Queen's Diamonds. 9. The Queen's Engagement Ring: On returning from South Africa, Princess Elizabeth was finally ready to reveal a major secret: she was engaged to Lieutenant Philip Mountbatten, a naval officer who had been born Prince Philippos of Greece and Denmark. Her new fiance offered her a stunning diamond and platinum engagement ring, which had been made by craftsmen at Philip Antrobus, a London jewelry firm. Like Philip himself, the diamonds in the ring had a serious royal pedigree: they came from a diamond and aquamarine tiara that had been given to Philip's mother as a wedding present by Nicholas and Alexandra, the last emperor and empress of Russia. (A lovely diamond bracelet was made as Elizabeth's wedding present from Philip using stones from the same tiara.) Elizabeth wore the ring in public for the first time on July 10, 1947. She still wears it today, although it's usually hidden by a pair of gloves. 10. The Diamond Clematis Brooch: At the photocall following Elizabeth and Philip's engagement announcement, the princess wore her new ring with another piece of diamond jewelry: a brooch in the shape of a six-petaled clematis flower. It's not clear exactly when the brooch arrived in Elizabeth's collection, or who made the piece, but the Queen still owns and wears it on a fairly regular basis today.